High speed rail development has become closely tied to the future of our large metropolitan areas. 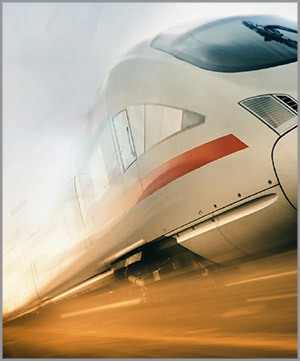 The increasing globalization of the marketplace requires changes in many areas of the railway industry. Environmental and safety concerns will play important roles in future rail development. Induction heating is widely known throughout the railway industry for its ease of integration and ability to streamline and combine multiple process stages. Induction heat treating is used fo manufacture parts for assemblies, bearings, brakes, drive trains, gears, joints and shafts. In addition of heat treating, other applications for induction heating in both rolling stock and infrastructure manufacturing include axle heating and straightening of body panels. Induction heating is widely used throughout the railway industry.